Last week saw some huge drops from many large department stores thanks to disappointing earnings. Then on Friday, April retail sales came in at 1.3%, well above the consensus estimate. In fact, this was the best monthly gain since March 2015. So, which is it? Is the consumer dead or is there something else we are missing? 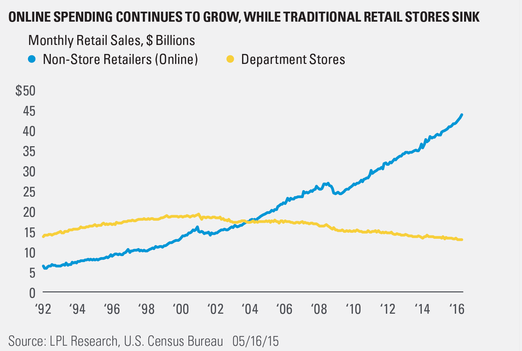 In other words, online spending is soaring, while traditional department spending is stagnant. Here are a few stats to put all of this in better perspective. Total retail sales for department stores last month was $13.3B. Non-store retailers (online) had sales of $45.2B. Compared to department stores ($13.3B), gas stations saw sales of $32.6B last month, grocery stores had sales of $52.2B, and restaurants/bars came in at $54.1B. People are spending, just not at department stores. Incredibly, total monthly retail sales at department stores in January 1992 were $14.1B. Compared to the $13.3B for April, that’s a long time with no growth to show for it. Department stores and non-store retailers (online) sales were both $17.8B in November 2003. Since that time, non-store sales have surged +153%, while department stores have dropped 25%. Lastly, according to recent data from the U.S. Census Bureau, e-commerce made up 7.5% of all retail sales during the fourth quarter last year. Incredibly, since this data started in late 1999, e-commerce as a percentage of retail sales hasn’t dropped for 64 straight quarters. It was 0.9% in the fourth quarter of 1999 and was up to 7.5% at the end of last year. 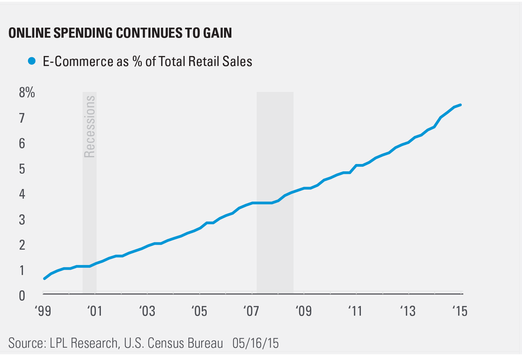 The U.S. consumer isn’t dead, spending habits have simply changed. For more on what we are seeing from the consumer now, be sure to read John Canally’s recent Weekly Economic Commentary, Consumer Check-In.